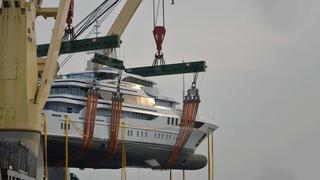 The 55.85 metre Benetti superyacht Genesis II has been delivered to her owners in Hong Kong. Genesis II – known only by her hull number FB266 previously – is a close sistership to Lady Candy. The interior of both these superyachts was designed by Central Yacht and share some details such as a 100msq saloon on the main deck, the upper deck layout with two master suites and the wheelhouse on the fourth deck. Where Lady Candy has a large beach club, there will be a stern garage for Genesis II. Some of the exterior styling has also been updated to the new owner’s wishes. It’s not known if Genesis II will share other interior features with Lady Candy, such as a dedicated cinema, private offices to complement the master suites and private crew areas that allow the crew to work safely and relax during extended cruises. We do know that Genesis II is 900GT and has a cruising speed of 15 knots. 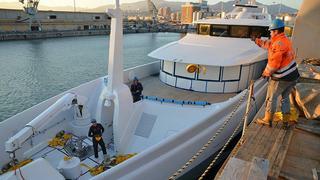 She has a steel hull, an aluminium superstructure and a teak deck. 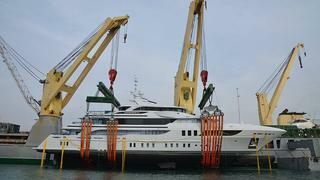 This full displacement yacht spent a brief season cruising the Mediterranean this summer ahead of her delivery. 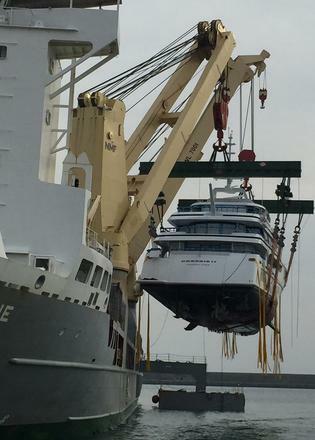 Genesis II was transported from Genoa to Hong Kong by Sevenstar Yacht Transport, who shared the images of the luxury yacht in transit.